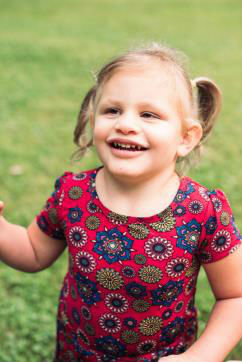 Elizabeth is a very independent 5-year-old girl with little to no vision, due to severe Optic Nerve Hypoplasia. Elizabeth was born on July 24, 2013. Right away doctors were aware that her eyes were having challenges. They were severely crossed and didn’t seem to be tracking. At about 6-months-old, Elizabeth was referred to an eye specialist after doctors could not find the cause of her eye condition. Immediately, the doctor knew that little Elizabeth was suffering with an ONH (Optic Nerve Hypoplasia). ONH is a medical condition arising from the underdevelopment of the optic nerve. Basically, the nerves in her eyes did not develop properly. It was also discovered that Elizabeth has a rare condition called hypopituitarism. This condition affects the production of growth hormones in the body. Without the correct hormones, her body cannot work properly. Elizabeth is required to have nightly subcutaneous hormone injections to help supplement her growth. She also uses a cane or a guide to navigate terrains, due to her vision challenges. Elizabeth responds very well to calm, focused, and controlled environments. Sometimes she is very quick to memorize new areas. Her curiosity and “hands on” approach make exploring exciting. Elizabeth will be adopted as a Sparrow to Logos Charter School. Students at Logos will work hard to raise money for Elizabeth through sponsored community service and fundraising projects.